to achieve their goals and ambitions. Ken Braney, who is Managing Director of Thermoforming Solutions Ltd has had a very successful career in a variety of countries. His intial career was based in the plastics industry in the UK, then expanding into Europe and then moved to start up a German based company's operation in the USA. Since his return in the early 1990's he has been responsible for activities across Europe, The Middle East and India. He worked in the capacity of Director for these territories for a USA based thermoforming machinery manufacturer, so he has sampled and worked in the industry in a multitude of countries and cultures. The main focus is to help companies develop either new activities or inhance their existing portfolio. Currently working with a company entering the thermoforming manufacturing industry. The President of the USA organisation where he was employed for 12 years recently said, that his choice to appoint him to his company was the best personnel business decision he had made in nearly 40 years in industry. 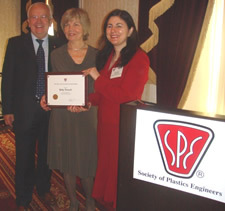 He was elected the President of The Society of Plastics Engineers from 2010-2011 (The first non USA person to hold that position), which is a 'Not for Profit' organisation with 20,000 members based around the world, with headquarters in the USA. He has great communication and leadership skills and the ability to help companies and individuals achieve their goals. All this experience is now being used to help companies in a variety of fields to achieve their goals and ambitions. It has been proved that this experience is very useful to all areas of public and commercial activity.